[Press release] The Victoria Hospital held a special handing over ceremony to thank the government and people of Japan for providing timely, life saving medical equipment valued at over US$80,000 to the hospital. 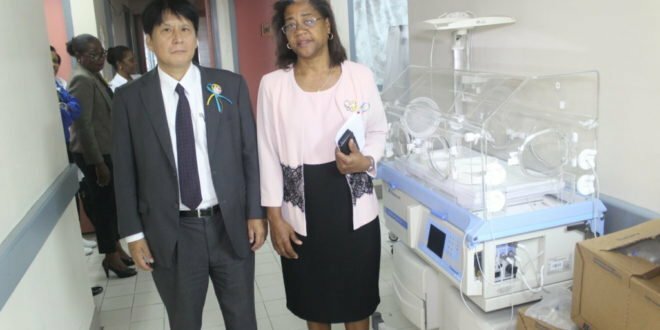 Twelve multi-parameter monitors, two incubators and three infant resuscitators were donated to the Victoria Hospital by the Japanese government under their Gant Assistance for Grassroots Human Security Project. Biomedical Engineer at the Victoria Hospital, Jessie Theobalds, said all equipment has been installed and the clinicians are absolutely pleased with the various devices. Whilst expressing her gratitude to the Japanese Government, Minister for Health and Wellness, Senator Hon. Mary Isaac highlighted the importance of this donation to the people of St. Lucia. Counsellor and Deputy Head of Mission of the Embassy of Japan, Yoshinori Yakabe was taken on a tour of Victoria Hospital to witness the equipment in operation within the various departments. Whilst on tour one parent in the pediatric department expressed personal thanks to the Counsellor on behalf of his child who was hooked up to one of the devices. The Deputy Head of Mission stated that apart from the health sector his government has contributed to several other sectors in St. Lucia. He was very pleased that the equipment was being fully utilized within the hospital. The handing over ceremony was held on Friday July 6th 2018.